Chautauqua Airlines, formed in Jamestown, NY in 1973, established their Florida operations as an Allegheny Commuter airline on February 22, 1979. Routes connected Lakeland, Ocala and Vero Beach to Orlando International from a Lakeland crew and aircraft base, utilizing 2 of their 3 Beech 99s. 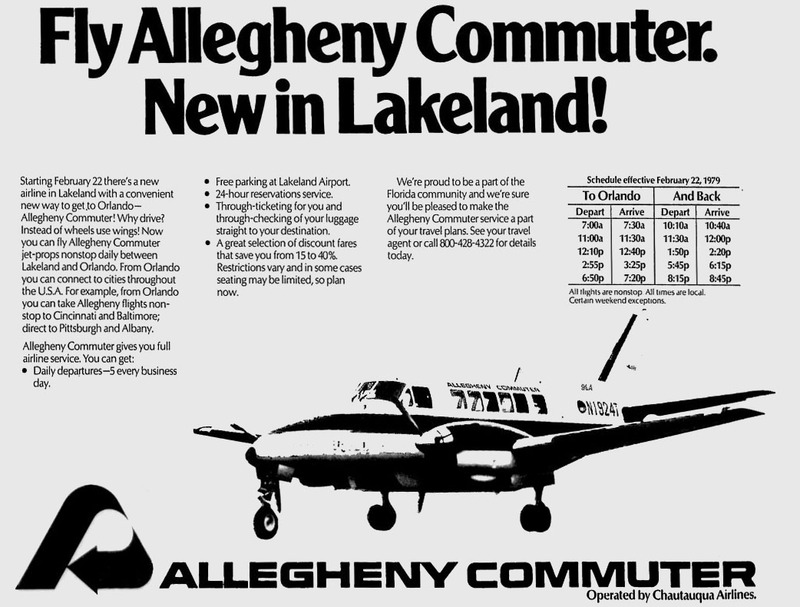 The contract service, in which Chautauqua funneled passengers into Orlando to connect with Allegheny Airlines flights to Pittsburgh and Philadelphia, has the distinction of being the first full-fledged commuter code-sharing agreement in the state, preceding the Air Florida Commuter system by more than a year. 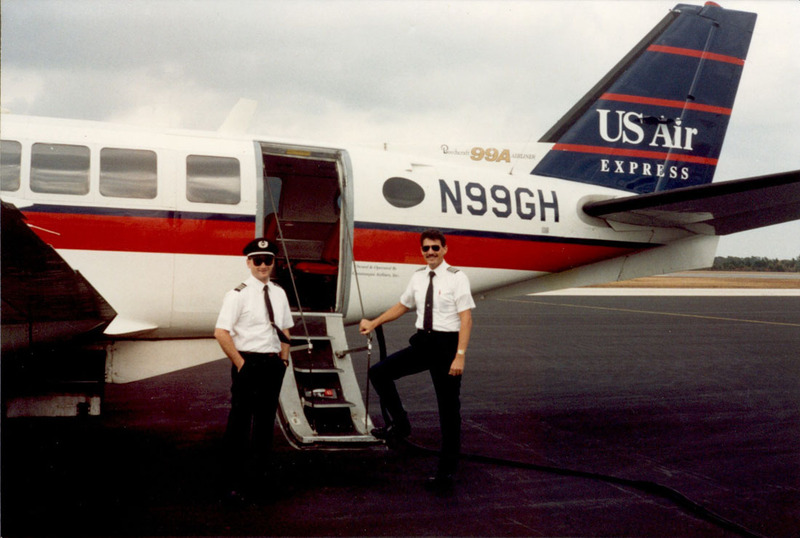 Todd Scher, a Vero Beach-based pilot for Chautauqua Airlines from 1980 until the airline left the Florida market in 1991, provided the majority of the photos and information on this page. During his time with the airline, he logged in excess of 7,000 hours of flight time in the Beech 99. Chautauqua operated three 15-passenger Beech 99 aircraft: N99TH, N99CH, and N99GH, seen here in 1980 in the original Allegheny Commuter color scheme. Lakeland, Ocala and Vero Beach were all cities that had lost airline service during the 1970s. Eastern Airlines had served Vero Beach for decades but pulled out when they became an all jet airline. Florida Airlines briefly served Ocala and Vero earlier in the decade and Lakeland had been served by Shawnee Airlines. 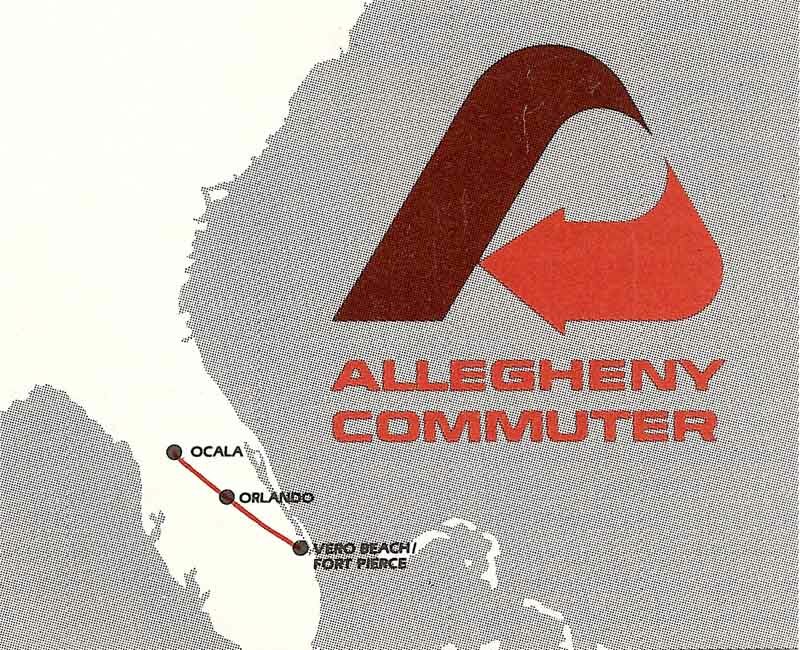 Chautauqua's flights to Vero Beach and Ocala were well supported but low passenger loads led to the termination of Lakeland service on September 15, 1980, as reflected in this 1981 route map. 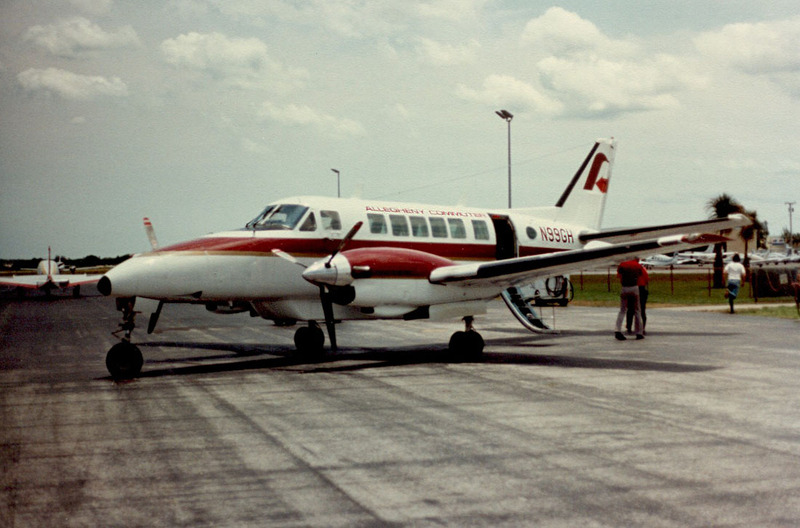 After the Lakeland service was discontinued, one Beech 99 was based in Ocala and the other in Vero Beach, which had become the airline's maintenance base. Beech 99 N99GH at Vero Beach, Florida. Photo courtesy of Todd Scher. N99GH is pictured at the mid-century modern terminal at Ocala / Silver Springs airport. 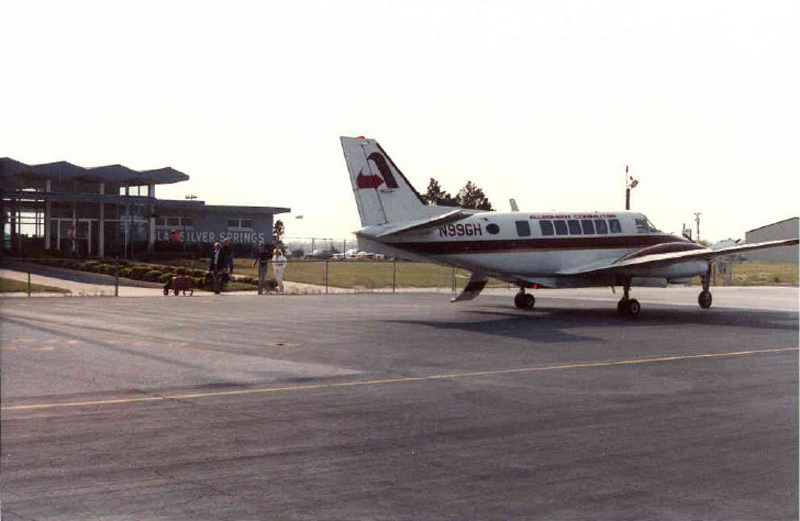 Service to Ocala was discontinued on June 30, 1987 and one of the Florida-based Beech 99s returned to Chautauqua’s Jamestown, New York base where the airline used them on their Jamestown/ Bradford (PA)/ Pittsburgh route. The sole remaining Florida aircraft continued the Vero Beach - Orlando route from the Vero Beach base. Photo courtesy of Todd Scher. 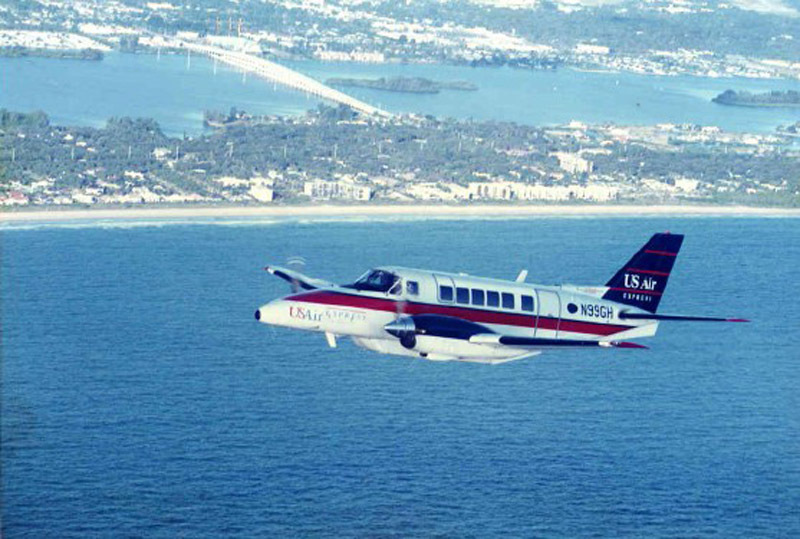 This beautiful air-to-air shot of N99GH, seen in updated USAir Express colors, was taken along the coastline of Vero Beach. Courtesy of Todd Scher. 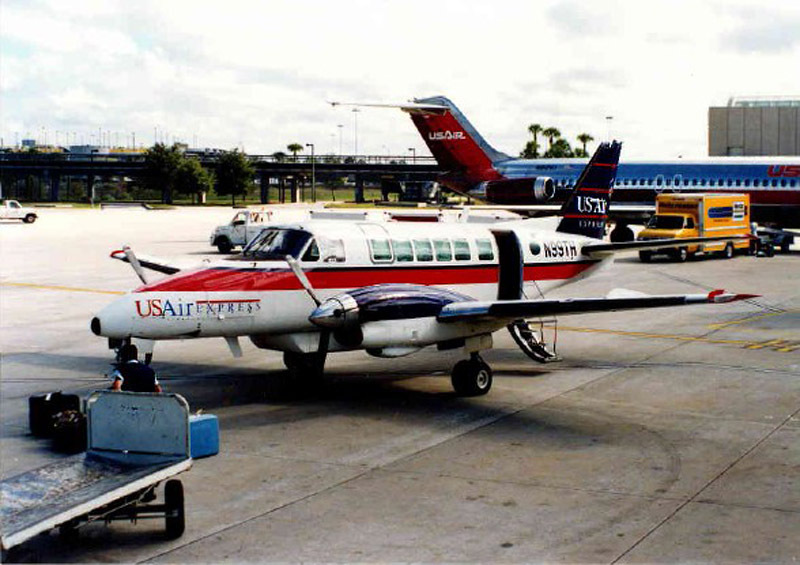 Beech 99 N99TH is seen at gate 21 in Orlando with a USAir DC-9 in the background. 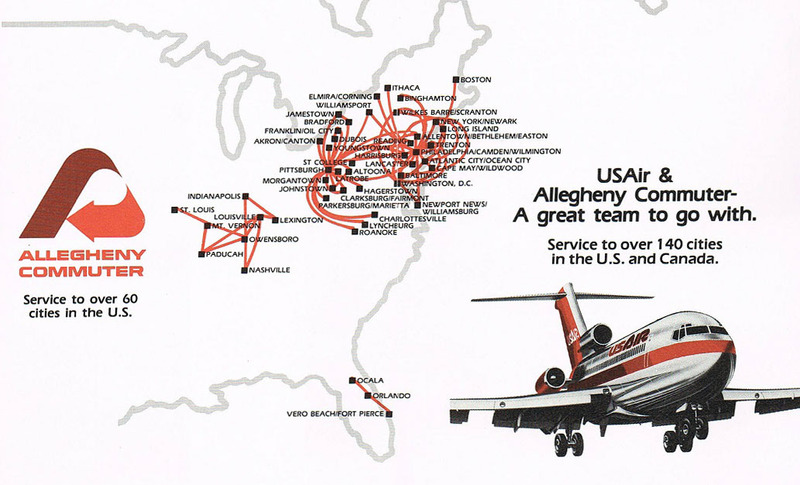 This was in the mid-80s, when USAir handled Chautauqua flights at their Terminal A gates. After the USAir merger with Piedmont, USAir moved their operations to the Piedmont MCO gates in Terminal B. Photo courtesy of Todd Scher. 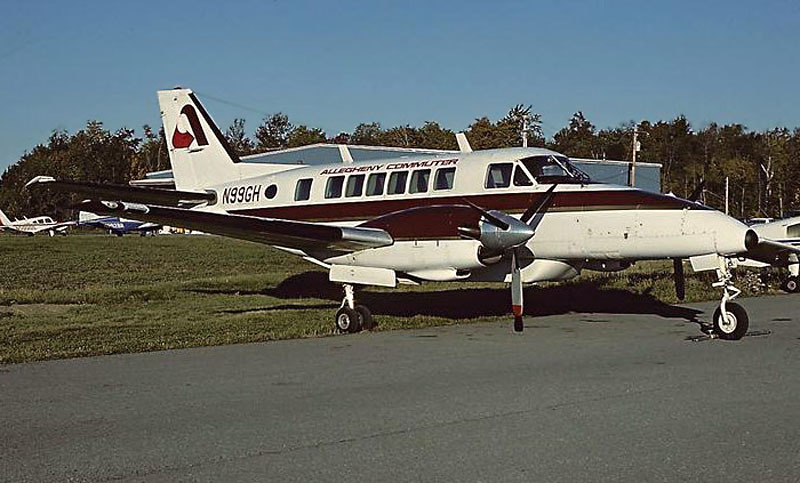 By the late 1980s, Chautauqua had replaced the Beech 99 with Swearingen Metroliners in their Northern operation, and all three of the carrier’s Beech 99 aircraft were based in Florida. 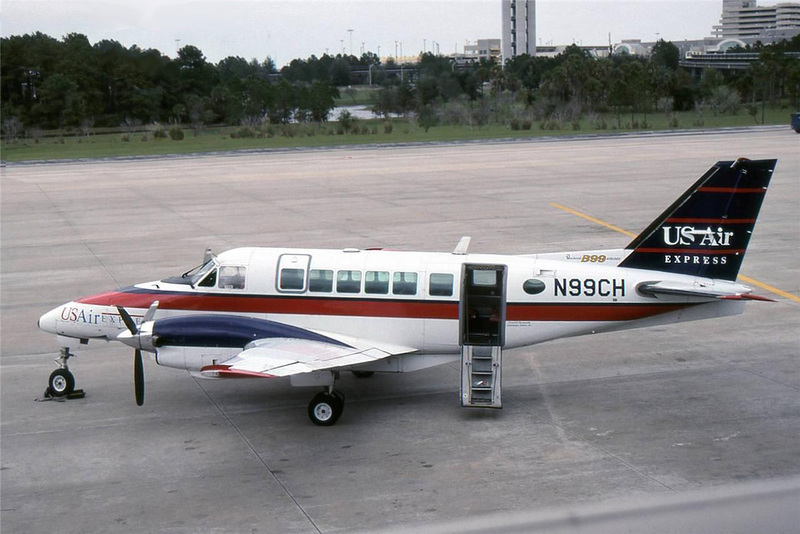 In addition to the Vero Beach base, Chautauqua established a crew base in Gainesville, opening up routes from Gainesville to Tampa and Orlando, utilizing one Beech 99. The third aircraft was kept in Vero Beach, and all three were rotated in service as maintenance needs dictated. N99CH is pictured at Orlando. 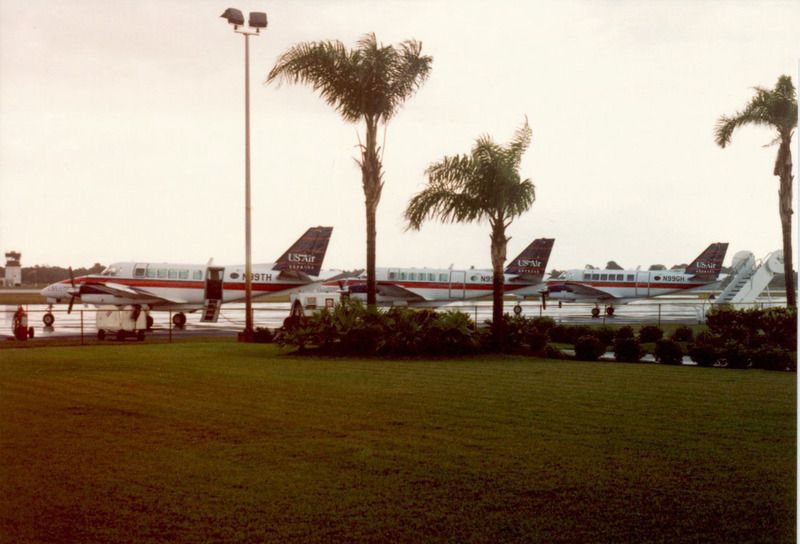 Two B-99s at gate 53 at Orlando, circa 1989-1990 after the USAir / Piedmont merger. One of the aircraft is being readied for departure to Gainesville, the other to Vero Beach. Photo courtesy of Todd Scher. 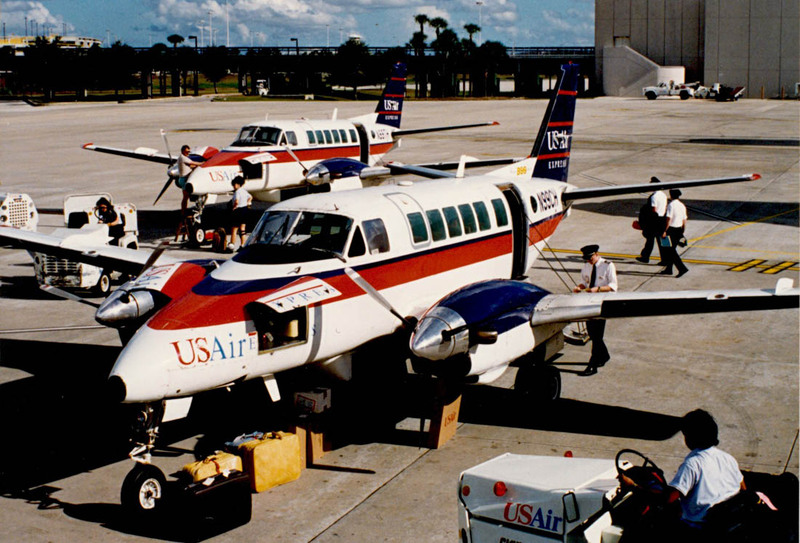 In late 1989, Chautauqua made the decision to cease Florida operations, and after closing down the Gainesville service in January of 1991, all 3 Beech 99s were positioned in Vero Beach since there were no other crew bases remaining in Florida. All three aircraft are pictured at Vero Beach, circa 1989-1990. Courtesy Todd Scher. 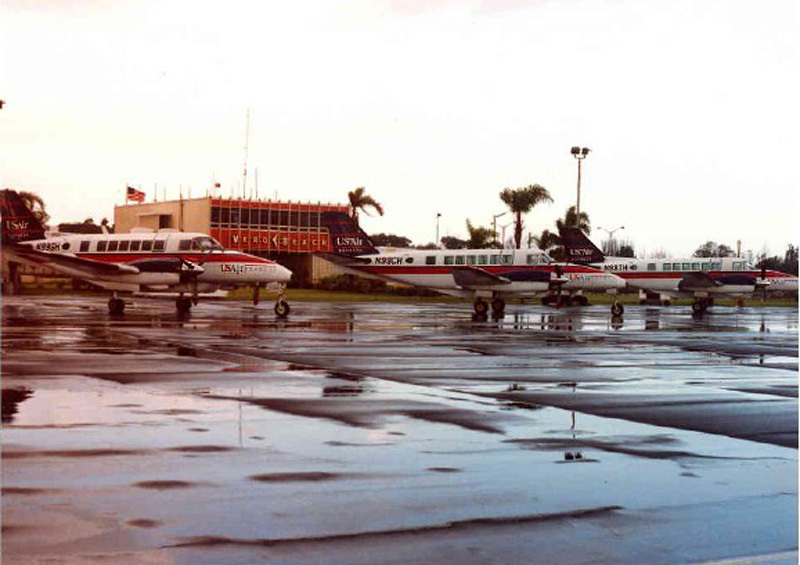 Another view of Chautauqua's Beech 99s at Vero Beach, Florida, circa 1989-90. Service between Vero Beach and Orlando continued into March of 1991, with the last revenue flight taking place on March 31, 1991. The Beech 99s were ferried to Canton-Akron (OH) airport for disposal. The last Chautauqua Beech 99 departed Vero Beach on April 2, 1991. Courtesy Todd Scher. Last but not least, a photo of the gentleman who generously provided the majority of the photos and information about Chautauqua: Todd Scher. That's him on the right. Thanks again Todd!